Aaron and the Mulch – He Said What?! Autistic individuals usually have an activity that calms them. 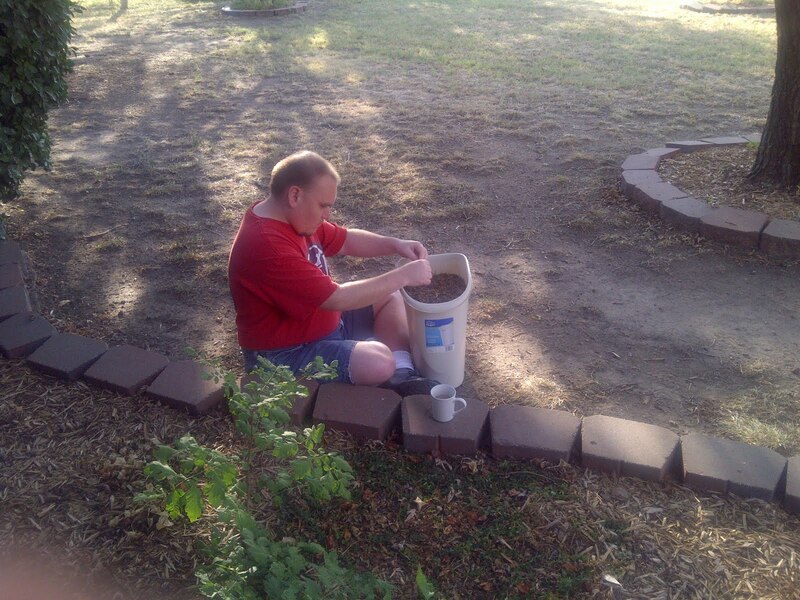 For Aaron, it’s sitting outside and breaking mulch or small leaves and twigs into a container. He’ll do it for long periods of time on some days. He’s usually making up stories in his head while he breaks the mulch or whatever into little pieces and drops them in the container. He’s unwinding or perhaps calming down after a stressful day on some occasions. I remember when he was a student at the day school. They had a padded room there, literally, for those who were having rages or were out of control. They could be put in that room and given a safe place to erupt and then calm down. Tom asked me if I wanted them to give Aaron time in that room on days when he was becoming very frustrated. But I told them to give Aaron a container and access to some leaves, grass, or twigs. Fortunately, there was a door that led from their classroom to a grassy area outside. And also fortunately, Tom listened to us and gave Aaron a container and permission to go outside and “play in the mulch”, as Aaron says. It worked beautifully for everyone. Aaron calmed down without always erupting, and Tom and the staff were spared from having as many breakdowns from Aaron. Aaron was outside with his container this morning, “playing in the mulch.” So I snapped a picture of him. No telling what stories are inside that head of his! For Jennifer she loves to color. So glad he has a way to relax his mind. I've heard that autistic people get frustrated easily, and also have too much information coming into their brain at one time. Having Bipolar Disorder myself, when I get manic my mind races and thoughts rush through my mind. I guess that's the closest I'll ever come to knowing what it's like for an autistic person. I also have to try to find things that calm me down.